Convertible cars have become an increasingly reasonable purchase thanks to years of innovations and improvements. Convertible top mechanisms are more compact and durable allowing increased storage space, internal noise has all but been eliminated thanks to higher quality convertible top materials, and the prices are becoming more economical every year. However, when buying your first convertible, you’ll need to look at much more than the convertible top itself. So, we’ve put together some important things to consider so you’ll be informed when you make this important decision. You should always check for water damage when buying any car, but it’s especially important when buying a previously-owned convertible. You’ll want to have your sense of smell intact when investigating a convertible and a flashlight can expose all sorts of issues. If there is the slightest hint of a mold or mildew smell, water stains under the floor mats or interior, or any tears in the lining between the doors, hood, and top, run away immediately. If the car is too fragrant, that may be an indication that they are hiding an odor likely caused by water damage. Sit in the car with the doors closed for several minutes slowly shining the flashlight along every seam and crevasse of the interior – trunk included. Many car manufacturers are making convertibles better suited for young people, as well as growing families. This means that you don’t have to compromise on space when it comes to buying a new convertible. As your life changes, choosing a convertible with more space means you won’t have to give it up if there’s an addition to the family, and the kids can have a safe, spacious car to drive when the time comes. More room also means more friends and more comfort on long trips. So, while you may be considering a small, sporty convertible, don’t forget about your future self and the needs you may want to accommodate beyond having the wind in your hair. When buying your first convertible, you’ll want to take your time and test drive every aspect of your potential new ride. This means raising and lowering the convertible top multiple times watching closely for any kinks or struggling of the mechanism. Aggressively rev the engine and when stopping push hard on the brakes repeatedly to test how they perform and whether or not they lose air pressure prematurely. Check the date of the last oil change and inspect all fluids and filters. Check under the hood before and after test driving to see if any oil or fluid leaks are present and look under the car for any drips that aren’t condensation from the AC. Whenever you buy any car, always ask for any maintenance records the seller may have including oil changes, recalls, scheduled maintenance, and any other paperwork on the vehicle. They may have very little or none at all, but it’s a good idea to ask. Once you have narrowed down your choices, you’ll want to run a vehicle history report through one of the several online sites including Carfax and AutoCheck. They cannot always find everything, but they do provide a wealth of information and can save you from buying a wrecked or damaged convertible. If you are unfamiliar or not confident in your ability to identify issues when buying a convertible, always take a friend or family member who is familiar with auto mechanics to help you make the right decision. Your efforts cannot identify every problem, but you can increase your chances of buying a quality vehicle at a great price. What are your favorite tips for friends buying their first car? Share your thoughts in the comments below! Half the fun of owning a Jeep is all the wicked awesome mods! Jeep owners love to personalize their Jeeps with every imaginable upgrade to give them the edge on and off the trails. Jeep has incorporated this aspect of their fan base into the development of their vehicles in order to give customers greater control over what they perceive to be the perfect Jeep. Whether cosmetic or functional, modding your Jeep is a fun and exciting way to make the most of your Jeep’s capabilities. So, here are some of our favorite Jeep mods we feel will make your Jeep the talk of the trail! If you were smart enough to buy a convertible Jeep, congratulations! Jeeps were made for the open air and experiencing everything the outdoors has to offer. Convertible tops and doors give you the ability to enjoy your Jeep through all seasons and weather conditions. The can be removed or installed in seconds and easily store away when not in use. New convertible tops and doors are also made with noise-dampening materials for a quieter, more comfortable ride. If you own a Jeep convertible, security is likely a concern. Storage vaults are a great way to transport and store your valuables without any concern of theft or damage from the elements. 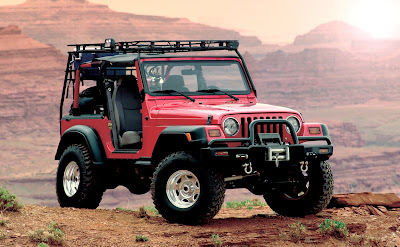 You can find plenty of storage vaults specifically designed for your Jeep model that provide a perfect fit. These storage vaults are extremely durable and great for hardtop Jeeps, as well as SUVs and other recreational vehicles. If you’re going off-road, you’ll need to make sure your Jeep is ready. Every off-road Jeep should be equipped with trail-ready tires and a lift kit for adding clearance between the ground and frame. A suspension lift will increase the clearance between the axles and frame while a body lift increases the clearance between the frame and body. Installing a lift kit is not a simple task and requires several modifications to your existing internal systems including extending the brake lines and longer shocks. Make sure to consult a professional before embarking on this intense endeavor. When it comes to installing a winch and tow line, it’s better to have one and not need it than to need one and not have it! If you find yourself getting stuck, a winch can save you from having to embarrassingly ask others for help, and gives you the opportunity to look like a hero when you use it to pull a friend from the mud. It’s a win-win Jeep mod. They look awesome and are exceptionally functional on the trails. From freeing your vehicle to removing large debris from the trails, a winch is a versatile and extremely useful upgrade. This is one of those mods that’s both cosmetic and functional. Whether you install a light bar or individual LEDs, the additional lighting provides plenty of nighttime visibility and looks awesome! Many of these systems tie directly into your fuse box so they can be operated using your existing light switches. Jeeps are the most popular off-road vehicles for a reason. They are fully customizable, durable, and built for fun! They are the most perfect off-road vehicle to date with few competitors within site. Send us pics and share stories of your best mods and favorite upgrades. We’d love to hear from you!